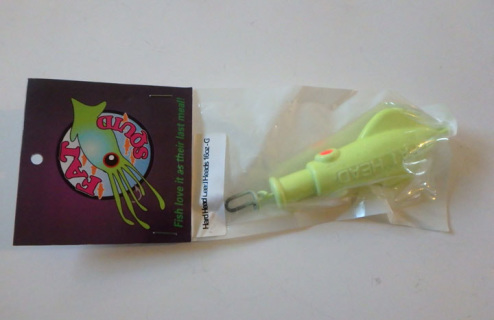 Leadheads Online Sport Fishing Tackle Store Featuring Artificial Squid Lures From SquidPro Tackle. Our brands include, FAT Squids, Z2 Squids, Squiddy Squids, Hard Head Squids, mini FAT Squids and Floochies. 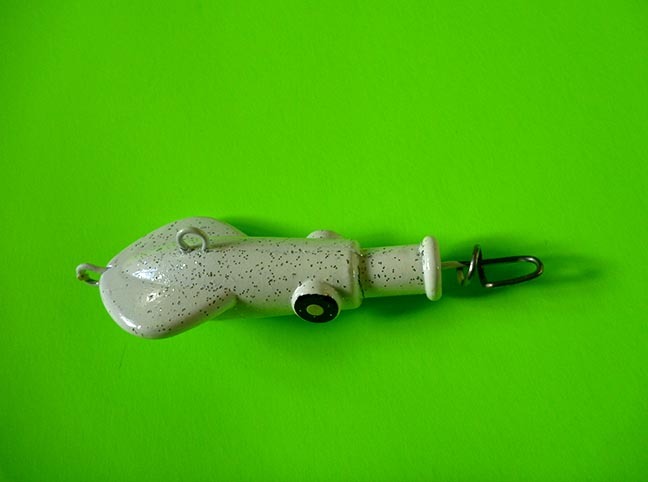 Quickly and easily turn any fully rigged squid into a high-action articulated jig lure by attaching it to the corkscrew on the end of this jig head. Works great with Fat Squids and Z2 Squids. Click product photo for larger image. 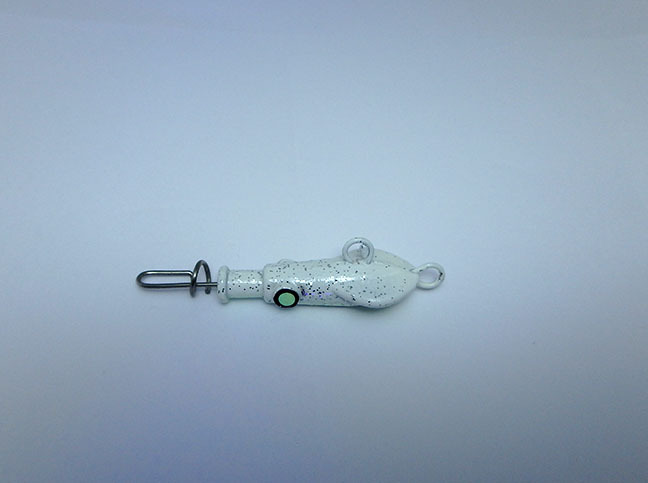 3 ounce jig head in white color. 2 1/2 inches long. 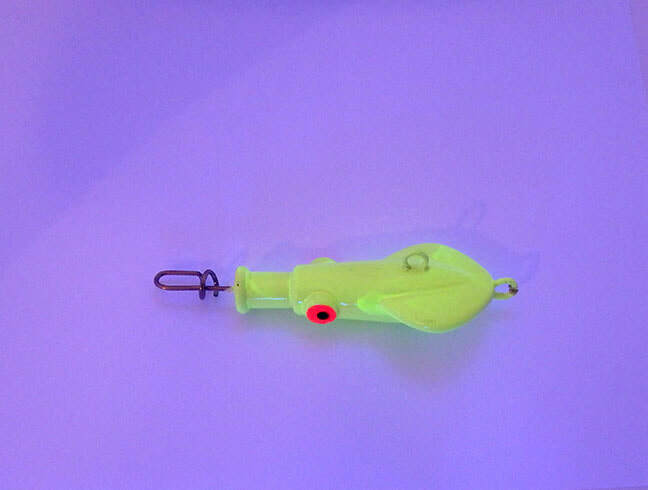 Corkscrew for easy squid lure attachment. Two line attachment rings means you can customize the action with your choice of using the one on the top or the one on the side. Use with any fully rigged artificial squid lure. Great for halibut, lingcod, rockfish, and many other species. 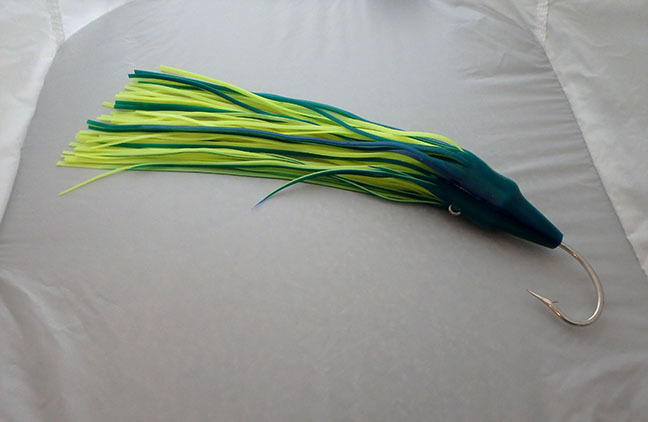 Add weight to your fully rigged artificial squid lures with this 8-ounce jig head with corkscrew attachment ready to hook on any fully rigged squid like Z2 or Fat Squids. Control the articulated action with your choice of two different places for line attachment. Add weight to your fully rigged artificial squid lures with this 12-ounce jig head with corkscrew attachment ready to hook on any fully rigged squid like Z2 or Fat Squids. Control the articulated action with your choice of two different places for line attachment. 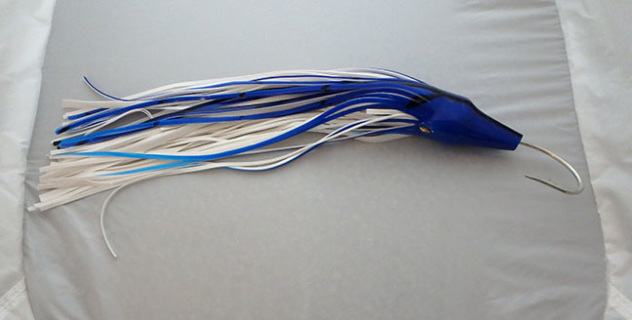 Add weight to your fully rigged artificial squid lures with this 16-ounce jig head with corkscrew attachment ready to hook on any fully rigged squid like Z2 or Fat Squids. Control the articulated action with your choice of two different places for line attachment. 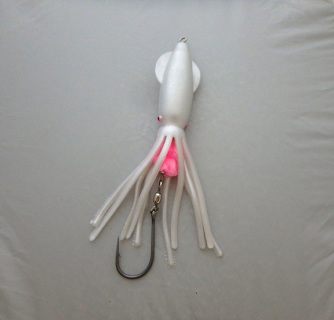 Squid and Jig all in one with these fully rigged 9-inch artificial squid lures with 12 ounce led insert. Glow-in-the-dark 9-inch Z2 Squid soft bodied artificial squid lure with 12 ounces of lead inside the squid's head. Fully rigged with stainless leader, yarn scent ball, swivel, and 9/0 J-hook. White 9-inch Z2 Squid soft bodied artificial squid lure with 12 ounces of lead inside the squid's head. 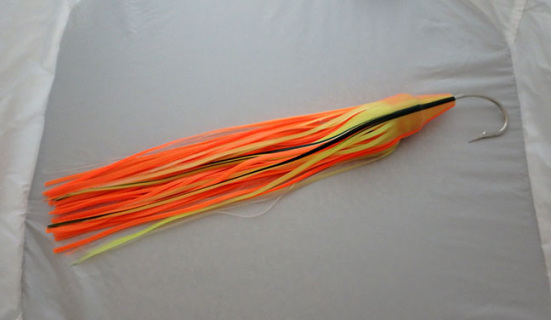 Fully rigged with stainless leader, yarn scent ball, swivel, and 9/0 J-hook. Big jigs catch big fish. 14 inch long double skirt over 16 ounce leadhead jig with J-hook. 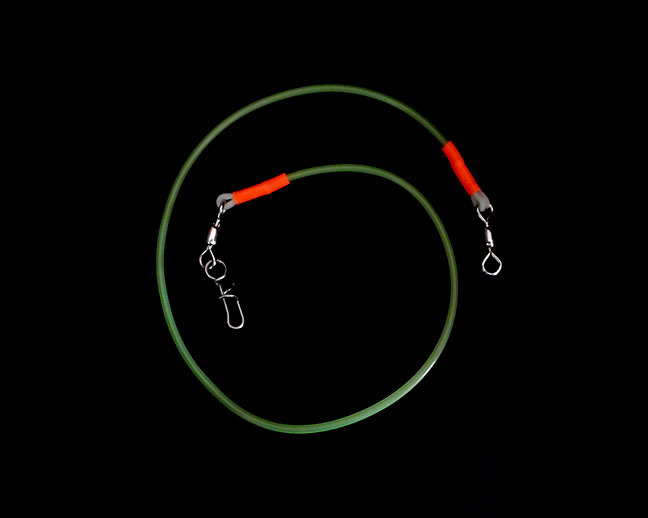 Invented and tested by Alaska Angler writer Chris Batin. 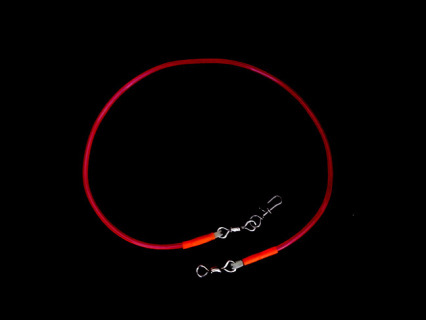 These bright glow or UV leaders light the way to your lure so more fish can find it. 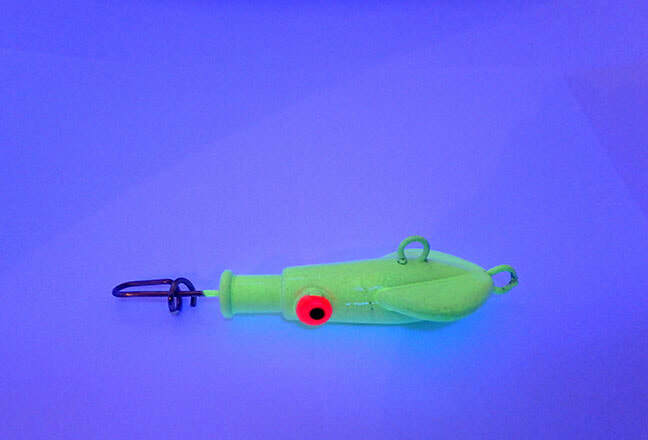 Using a swivel on your lure enables quick tackle changes and helps prevent loss of fish or lures due to chaffed line. 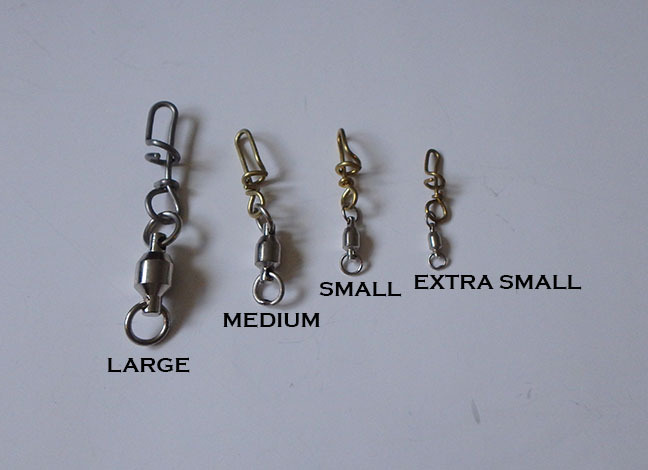 Corkscrew swivels make tackle changes easy and help prevent loss of fish and lures from chaffed lines. 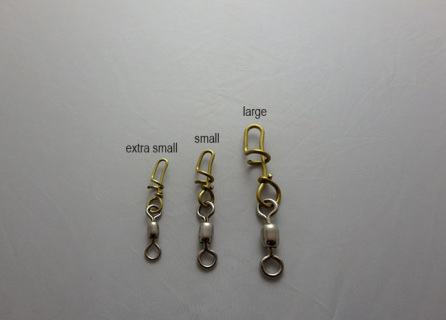 These large custom made ball bearing swivels are the biggest of all the swivels we sell. 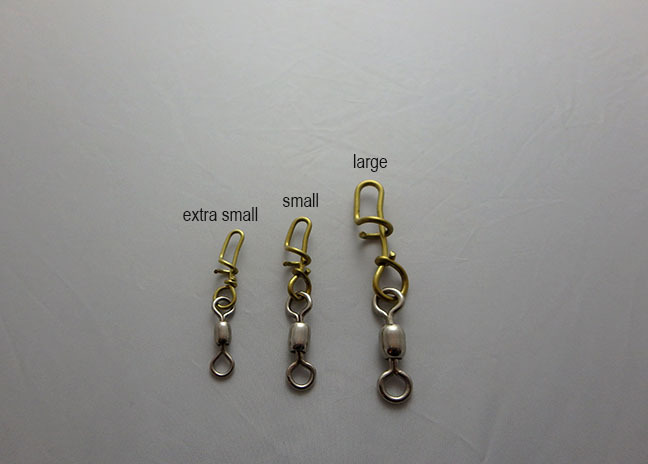 3-pack medium sized custom made ball bearing corkscrew swivels. Corkscrew swivels make tackle changes easy and help prevent loss of fish and lures from chaffed lines. Click product photo for larger image. All products ship worldwide by US Mail. We accept cards or PayPal. You can use your card through the card option or choose to use it through PayPal whether you have an account there or not. Orders normally ship next business day.